We offer our clients a vast range of Food Processing Machines. 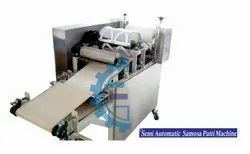 We are eminent Manufacturer, Exporter, Supplier, Trader ofSemi Automatic Samosa Strip Making Machine,Samosa Making Mchine,Samosa Machine,Samosa Strip Machine,Semi Automatic Samosa patti Making Machine,Semi Automatic Samosa patti MachineSemi Automatic Samosa Strip Maker,Fully Automatic Samosa Strip Maker,Samosa Making Machine. We design, fabricate and offer an extensive array of processing machines that is made using high quality raw materials and precision made parts. Widely applicable in the food industry, Samosa Making Machines are known for their efficiency and cost effective rates. Samosa Making Machines are available have sturdy and compact design. 1.machine dough just needs to be fed into the hopper and at the outlet one gets raw puri. 3. Thus, these machines offer oil free, hygienic at economical prices. 4.One set of TEFLON coated roll with thickness setting arrangement, flour sprinkling arrangement, and one number dies roll, endless PVC food grade belt is mounted on stainless steel covered fabricated angle stand. Food Grade Roller for pressing. Widely applicable in the food industry, Semi Automatic Samosa Patti Machines are known for their efficiency and cost effective rates. Semi Automatic Samosa Patti Machines are available have sturdy and compact design. Widely applicable in the food industry, Samosa Patti Making Machines are known for their efficiency and cost effective rates. 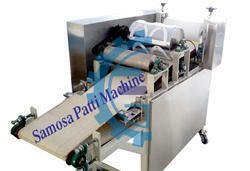 Samosa Patti Making Machines are available have sturdy and compact design. Looking for Samosa Patti Making Machine ?